Sony's first tangential Biotracer - trying to square the round peg for the new decade. However, the X800 didn't start at all as it is known today. Throughout the 1970s Sony had refined speed accuracy, resistance to load and even included in its first (radial) Biotracer the damping of the resonant peak and many other problems by way of V and H sensors. What was left to achieve was to drastically reduce the overall noise floor - beyond what could be done with a 1978 Biotracer. 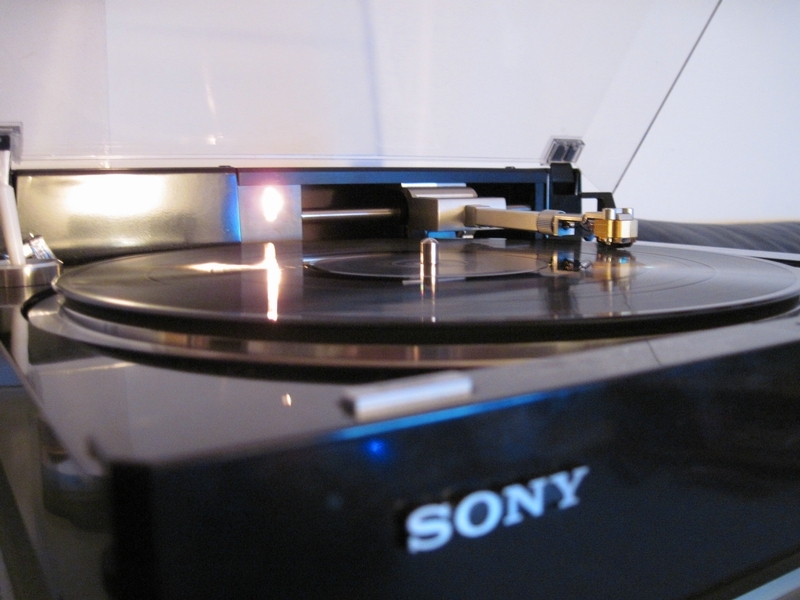 Being very coherent, Sony devised in 1980 a turntable which would have a fixed tonearm and a moving platter - in other words what would be done for the CDP-5000 or the later CDP-XA7ES, CDP-X5000 or CDP-R10 ! This however was deemed too expensive to manufacture properly, especially for a dying format such as LP, kicked as it was then by blank cassettes on on side and the upcoming DAD on the other. Exit early FPM, enter the PS-X800, rushed into production. The electronic problems many X800 are afflicted with have nothing to do with the Biotracer itself but with the way it was implemented inside the X800 chassis - read the "USER" section ! Otherwise, the X800 is a gem. The tangential Biotracer lowers the resonant peak by 3dB, does antiskating duties electronically, automatically and gradually from outer to inner groove as inside force increases, it goes wherever you want with its two-speed pads and has like the previous Biotracers an on-the-fly tracking force adjuster. There are two motors for the arm : one for fast or slow positioning (belt-driven) and one for actual tangential tracking (BSL again) - see the "USER" section again and the drawing below for the structure ! The three motors (1x platter, 2x tonearm) are electronically linked together and so are, naturally, their speed detection & control - complex. The base is made of a single block of SBMC (Sony Bulk Mold Compound), the feet are gel-filled and height-adjustable, the platter is dynamically balanced and damped on its underside. The platter motor is a sturdy BSL and platter speed is controlled by way of Sony's usual Magnedisc : barium-ferrite imprint read by an 8-pole magnetic head. Headshell-wise, the X800 is worth using with a carbon-clad Sony SH-160 but, weight-wise, it will be too heavy unless one adds one or two of the supplementary counterweight at the back of the arm... Said supp. cw have been lost most of the time so, if unavailable, better stick to lighter headshells. Well reviewed in Japan and one of the best affordable tangential turntables ever made - it looks like a toy but it really is not. Somewhat better but mostly more reliable than the ultimate PS-X555ES which cost half the price, the X800 sold extremely well worldwide. Rushed to production as it was, the X800 wasn't made available under the Wega name and its beautiful hellgrau color (very light grey) like the PS-X7 was - pity. I am the proud owner of one (which will be refinished in hellgrau one of these days :) - paired with a Sony XL-44L I've got musical bliss and rythm. To have your X800 restored and adjusted properly, see here. Went to pick up my freshly (well a year ago or so) overhauled PS-X800 turntable. Done by an awesome electronics expert with a soft spot for Sony (well the good stuff anyway). Hadn't been able to pick up for a number of reasons (mainly it being 205km away from home), but today I decided to finally make it happen and so now I have my precious table back at home. Perfectly set-up (for as much as you can yourself) with the Denon DL-304 cart dialed in nicely. I had forgotten what a joy these are to use. To see all the automatic stuff working to meticulously, it's just beautiful. Finally have my main set almost as good as new now. PS-X800, TA-E88B, TA-N7B all overhauled, and a newish modded SCD-555ES (I do plan on re-introducing the CDP-X777ES as soon as it's had its once-over). Slipping Kraftwerk - The Robobs onto the table, hitting play, sitting back and hear the music unfold in front of you. Then Donald Fagen - The Nightfly, then Bladerunner theme, Alan Parsons Project. Somehow I think I'll be listening to a lot more music again in the time to come. PS-X75 needed care again, so wasn't so inclined to mess with it much lately. Also a huge lack of time playing its part. This is nice turntable but sound will be better with phono clamp. Pro-ject has a good tiny acrillic and transparent clamp which is perfect match for your turntable. Cheap and not so weight (approx a half kilos - enough for direct drive turntable). I have an acrylic phono clamp, but I can't be bothered to use it. Sounds more than good enough for me and didn't seem to make all that much of a difference to my ears, but thanks for the tip! have a little brother of it, x 600.
i can feel the base is better than my other budget table. one problem is the TACT switch made by ALPS under the buttons getting into their final days. they are very low profile, which is only 2.5 mm high. the thinnest one that i can find from ALPS current line is 4.3 mm. What twicks did he make?